描述了包括TeO2和/或Bi2O3的不含锑的玻璃，其适用于制备气密密封的玻璃封装件的玻璃料。 It describes glass includes TeO2 and / or Bi2O3 antimony-free, which is suitable for preparing a glass frit hermetically sealed package. 气密密封的玻璃封装件例如OLED显示器的制造包括提供第一玻璃基板和第二玻璃基板并将不含锑的玻璃料沉积到第一玻璃基板上。 Hermetically sealed glass package, for example, manufacturing an OLED display includes providing a first glass substrate and the second glass substrate and the antimony-free glass frit is deposited onto the first glass substrate. OLED可沉积到第二玻璃基板上。 OLED may be deposited onto the second glass substrate. 然后，利用辐射源(例如，激光、红外线)来加热玻璃料，使其熔化并形成连接第一玻璃基板和第二玻璃基板的气密密封，同时保护设置其间的OLED。 Then, using a radiation source (e.g., laser, infrared light) to heat the frit to melt and form a connection a first glass substrate and the second glass substrate is hermetically sealed, while protecting the OLED disposed therebetween. 不含锑的玻璃具有优异的水耐久性,良好的流动性,和低玻璃化转变温度。 Antimony-free glass having excellent water durability, good flowability, and low glass transition temperature. [0001 ]本申请根据35U. SC § 119 (e)的规定，要求2012年8月30日提交的美国临时申请序列第61/695033号的优先权，通过引用将该申请全文纳入本文。  This application pursuant to 35U. SC § 119 (e), requiring the United States August 30, 2012, filed Provisional Application Serial No. 61/695033, which application is hereby incorporated by reference herein. 本发明涉及不含锑的玻璃，由其制备的玻璃料，和用所述玻璃料密封的气密密封的玻璃封装件，该玻璃封装件适于包含对周围环境敏感的装置例如薄膜装置。  The present invention relates to an antimony-free glass frit prepared therefrom, and with the frit glass sealing hermetically sealed package, which package is adapted to contain a glass surrounding environmentally sensitive device, such as a thin film device. 这种装置的一些示例是有机发光二极管(0LED)显示器、传感器、光伏和其它光学装置。 Some examples of such devices are organic light emitting diode (0LED) displays, sensors, photovoltaics and other optical devices. 本发明使用0LED 显示器作为非限制性例子来阐述。 The present invention uses a display 0LED illustrated as non-limiting examples. 最近，已使用基于玻璃的玻璃料来密封玻璃封装中玻璃基板，为封装的器件提供优异的气密性。  Recently, the use of glass-based glass frit to a glass substrate in the sealed glass package, providing excellent airtightness of the packaged device. 但这些玻璃料大多包含毒性元素，例如锑，造成环境危害。 But most of these frits contain toxic elements, such as antimony, cause environmental harm. 因此，需要不含锑并且Tg低的适用于气密密封玻璃封装件的基于玻璃的玻璃料，所示玻璃封装例如是电子器件(例如，用于显示器类型的应用）。 Therefore, a low Tg and non-antimony-based glass frit suitable for use in hermetically sealed glass package, a glass, for example, an electronic device package shown (e.g., an application for a display type). 本发明包括气密密封的0LED显示器和用于制造该气密密封的0LED显示器的方法。  The present invention comprises a hermetically sealed 0LED display and method for manufacturing the hermetically sealed 0LED display. 基本上，气密密封的0LED显示器的制造包括提供第一玻璃基板和第二玻璃基板并将玻璃料沉积到第二玻璃基板上。 Basically, the hermetically sealed 0LED manufacturing a display comprises providing a first glass substrate and the second substrate and the frit glass is deposited onto the second glass substrate. 诸如在0LED制造过程中使用的那些有机材料可沉积到第一基板上。 Organic material such as those used in the manufacturing process 0LED may be deposited onto the first substrate. 然后，利用辐射源(例如，激光、红外线)来加热玻璃料，使其熔化并形成连接第一玻璃基板和第二玻璃基板的气密密封，同时保护0LED。 Then, using a radiation source (e.g., laser, infrared light) to heat the frit to melt and form a connection a first glass substrate and the second glass substrate is hermetically sealed, while protecting 0LED. 玻璃料是不含锑的玻璃，其包括钒，和在一些实施方式中降低热膨胀系数(CTE)的填料，从而当辐射源加热玻璃料时它软化并形成连接。 Antimony-free glass frit is glass comprising vanadium, and lower coefficient of thermal expansion (CTE) In some embodiments, the filler, so that it softens and is formed when the source connected to heat the glass frit. 这能使玻璃料熔化并形成气密密封，同时避免对0LED造成热损伤。 This enables the frit to melt and form a hermetic seal, while avoiding thermal damage to 0LED. 例如，已经证实磷酸钒玻璃料尤其适用于密封所述类型的玻璃封装件，具体是含锑的磷酸钒玻璃料。 For example, it has been confirmed that vanadium phosphate glass frit is particularly suitable for sealing the glass package type, in particular vanadium phosphate glass frit containing antimony. 这种玻璃料非常稳定，具有高的吸光度以及优异的机械和水耐久性。 This glass frit is very stable, having a high absorbance and excellent mechanical durability and water. 不幸的是，锑是毒性元素，因而已努力寻找不会对玻璃料的其它有益属性造成有害影响的锑的替代品。 Unfortunately, antimony are toxic elements, which have been trying to find alternatives not cause harmful effects on other beneficial properties of glass frit of antimony. 将玻璃暴露于90°C蒸馏水(去离子水）以及85°C/85%相对湿度(RH)环境腔室测试对激光密封样品进行测试的实验室规模测试表明：基于Te0 2-Fe2〇3-Ti02-Zn〇-V2〇5-P2〇5系统的玻璃料在激光密封之后能形成气密密封。  The glass is exposed to a 90 ° C distilled water (deionized water) and 85 ° C / 85% relative humidity (RH) environmental chamber testing of laser sealing samples were tested laboratory-scale tests show that: based Te0 2-Fe2 Titania and glass-frit-Zn〇 〇3-V2〇5-P2〇5 laser system after the sealing can form a hermetic seal. 用（Fe 2〇3+Ti02)取代Sb2〇3以及至少部分地用Te0 2取代P2〇5的意料不到的结果是可获得当与不含Te的玻璃料玻璃(370°C_349°C例如）相比时可实现使Tg较大地降低。 With (Fe 2〇3 + Ti02) and at least partially substituted Sb2〇3 Te0 2 substituted with unexpected results are obtained when the P2〇5 Te-free glass frit (370 ° C_349 ° C e.g.) If the Tg can be achieved greatly reduced when compared. 其中Ti〇2+Fe2〇3范围是20摩尔％-35摩尔％，例如约20摩尔％-约30摩尔％，约25摩尔％-约35摩尔％和约25摩尔％-约30摩尔％。  wherein Ti〇2 + Fe2〇3 range is 20 mol% -35 mol%, e.g. about 20 mole% - about 30 mole% to about 25 mole% - about 35 mole% and about 25 mole% - about 30 mole% . 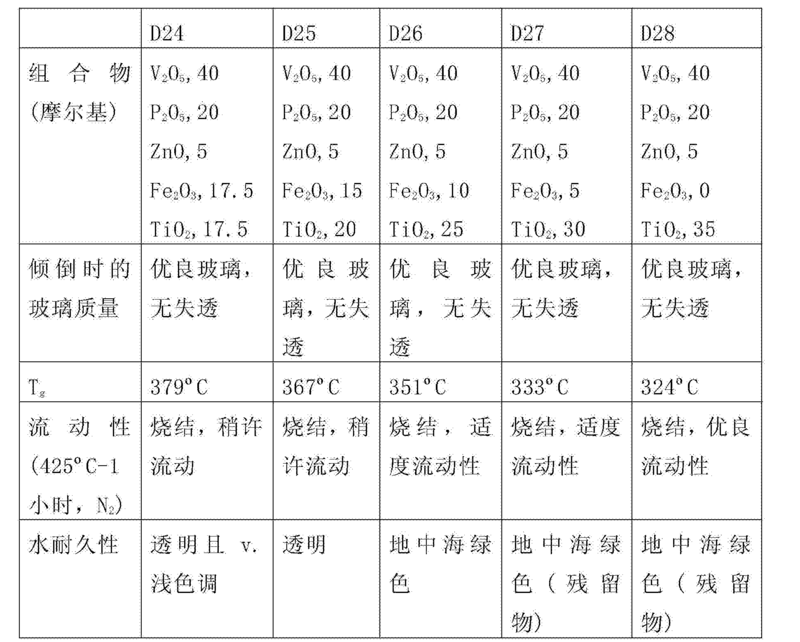 不含锑的玻璃的V205含量可为2 30和< 50摩尔％。  V205 content of the antimony-free glass may be 230 and <50 mol%. 在一些实施方式中，不含铺的玻璃的V2O5含量可为2 30和< 40摩尔％以及P2O5含量可为2 5摩尔％和< 15摩尔％。  In some embodiments, the non-plated glass content of V2O5 is 230 and <40 mol% of P2O5 and 25 mol% may be and <15 mol%. 在其他实施方式中，不含锑的玻璃的V2〇5含量可为2 35摩尔％和< 40摩尔％，P2〇5 含量可为2 8摩尔％和< 10摩尔％，和ZnO含量可为2 3摩尔％和< 7摩尔％。  In other embodiments, the antimony-free glass V2〇5 content may be 235 mol% and <40 mol%, the content may be P2〇5 28 mol% and <10 mol%, and the content of ZnO It may be 23 mol% and <7% by mole. Te〇2(15 摩尔％)。  Te〇2 (15 mol%). 在一些实施方式中，不含锑的玻璃的Tg < 350 °C。  In certain embodiments, the antimony-free glass Tg <350 ° C.
 在一些实施方式中，不含锑的玻璃可包括玻璃料。  In certain embodiments, the antimony-free glass may include glass frit. 玻璃料还可包括降低CTE的填料，例如β_锂霞石或β_石英。 Glass frit may further include a reduced CTE fillers such as quartz β_ eucryptite or β_. 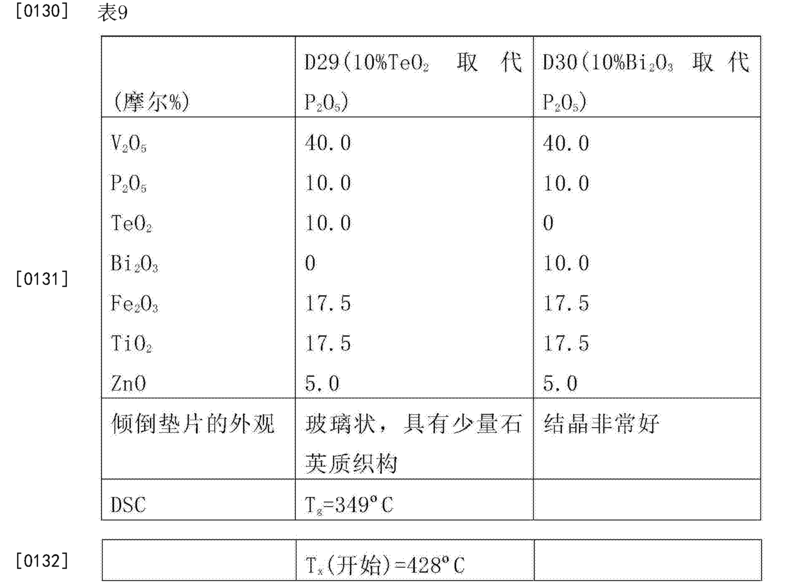 玻璃料的不含锑的玻璃的V205含量可为2 30和< 50摩尔％。  V205 content of the antimony-free glass frit may be 230 and <50 mol%. 在一些实施方式中，玻璃料的不含锑的玻璃的V205含量可为2 30和< 40摩尔％以及P2〇5含量可为2 5摩尔％和< 15摩尔％。  In some embodiments, V205 content of the antimony-free glass frit may be 30 and 2 <P2〇5 content of 40 mol%, and may be 25 mol% <15 mol%. [0041 ]在其他实施方式中，玻璃料的不含锑的玻璃的V2〇5含量可为2 35摩尔％和< 40摩尔％，P2〇5含量可为2 8摩尔％和< 10摩尔％，和ZnO含量可为2 3摩尔％和< 7摩尔％。  In other embodiments, the content of the glass V2〇5 antimony-free glass frit may be 235 mol% and <40 mol%, the content may be P2〇5 28 mol% and <10 mol%, and the content of ZnO may be 23 mol% and <7% by mole. 在一些实施方式中，玻璃料的不含锑的玻璃的Tg可为< 350°C。  In some embodiments, Tg antimony-free glass frit may be <350 ° C.
 在一些实施方式中，玻璃料可包括降低CTE的填料，例如β-锂霞石或β-石英。  In some embodiments, the glass frit may include a reduced CTE fillers such as quartz β- or β- eucryptite. 相应的玻璃封装件还可包括设置在第一和第二玻璃板之间的有机材料。  The respective glass package further includes a glass plate between the first and second organic materials. 例如，有机材料可包括有机发光二极管。 For example, the organic material may include an organic light emitting diode. 在一些实施方式中，玻璃封装件可包括平坦显示器面板例如有机发光二极管(0LED)显示器面板。 In some embodiments, the package may include a flat glass panel such as an organic light emitting diode display (0LED) display panel. 0LED显示器面板还可包括0LED显示设备例如电视、 计算机显示器、电话(例如手机)或包括光学显示器的任何其它装置。 0LED display panel may further comprise any other means 0LED display apparatus such as a television, computer monitor, telephone (e.g. a mobile phone) or comprise an optical display. 在其他实施方式中，不含锑的玻璃的V205含量可为2 35摩尔％和< 40摩尔％，P205 含量可为2 8摩尔％和< 10摩尔％，和ZnO含量可为2 3摩尔％和< 7摩尔％。  In other embodiments, the content of V205 antimony-free glass may be 235 mol% and <40 mol%, the P205 content may be 28 mol% and <10 mol%, and the content of ZnO may be 23 mol% and <7% by mole. 玻璃料可包括降低CTE的填料例如β-锂霞石或β-石英。  The glass frit may include reducing the CTE fillers such as quartz β- or β- eucryptite. 在一些实施方式中，玻璃料的不含锑的玻璃的Tg < 350°C。  In certain embodiments, the antimony-free glass frit Tg <350 ° C.
在一些实施方式中，玻璃料还可包括降低CTE的填料，例如β-锂霞石或β-石英。  In some embodiments, the glass frit may further include a reduced CTE fillers such as quartz β- or β- eucryptite. 参见附图，通过以下说明性的描述将更容易理解本发明，同时将更清楚地了解本发明的其它目的、特征、细节和优点，以下描述不是限制性的。  Referring to the drawings, the present invention will be more readily understood through the following illustrative description, and other objects will be more clearly understood the present invention, features, details and advantages thereof, the following description is not limiting. 预期所有这些另外的系统、方法、特征和优点都包括在该描述之内，包括在本发明的范围之内，受到所附权利要求书的保护。 It is intended that all such additional systems, methods, features and advantages be included within this description, be within the scope of the present invention, be protected by the appended claims. 图1是采用根据本发明实施方式的玻璃料对示例性0LED装置进行密封的横截面图。  FIG. 1 is a cross-sectional view of a sealing frit embodiment according to the present embodiment of the invention is exemplary 0LED device. 图2是热膨胀系数(CTE)随在根据本发明实施方式的不含Sb的玻璃料中以摩尔％ 表示的Fe2〇3代替Ti0 2而变化的图，其中Fe2〇3+Ti02为20摩尔％到35摩尔％之间。  FIG. 2 is a coefficient of thermal expansion (CTE) with 2 instead of Ti0 and varying in Fe2〇3 Sb-free frit according to embodiments of the present invention in FIG mol%, wherein 20 + Ti02 Fe2〇3 mol% to 35 mol% between. 图3是比较了CTE随加热和冷却条件下根据本发明实施方式的不含Sb的玻璃料和含Sb的玻璃料的温度变化的图。  FIG. 3 is a comparison of CTE with heating and cooling conditions in accordance with the change of the Sb-free embodiment of the present invention containing a glass frit and frit temperature Sb FIG. 图4是根据本发明的两种玻璃熔体的视觉比较。  FIG. 4 is a comparison of the two kinds of molten glass of the present invention vision. 图5是根据本发明的两种玻璃熔体的另一种视觉比较。  FIG. 5 is another visual comparison of the two kinds of molten glass of the present invention. 图6是适于用作根据本发明的实施方式的玻璃料的不含锑的玻璃的差示扫描量热测量图谱。  FIG. 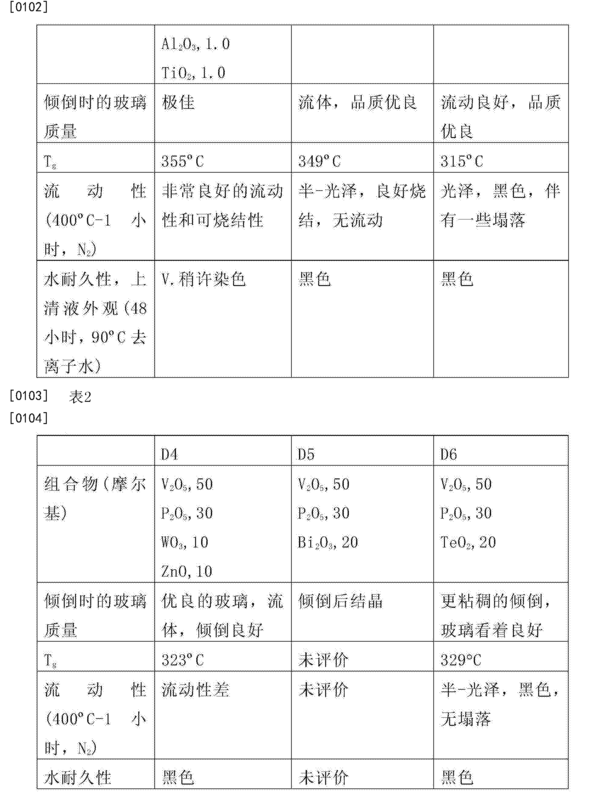 6 is suitable for use as scanning calorimetry spectrum according to the measured difference of the antimony-free glass frit according to an embodiment of the present invention. 在以下的详述中，为了说明而非限制，给出了说明具体细节的示例性实施方式，以提供对本发明原理的充分理解。  In the following detailed description, for purposes of illustration and not limitation, exemplary embodiments are given by way of illustration specific details to provide a thorough understanding of the principles of the present invention. 但是，对于本领域普通技术人员显而易见的是，在从本说明书获益后，可以以不同于本文详述的其它实施方式实施本发明。 However, those of ordinary skill will be apparent that, in the benefit from the present description, other embodiments may be practiced otherwise than as detailed embodiment of the present invention. 此外，可省略对熟知装置、 方法和材料的描述，从而不会模糊对本发明的各种原理的描述。 Further, it may be omitted, description of the methods well-known devices and materials so as not to obscure the description of the various principles of the present invention. 最后，在任何适用的情况下，相同的附图标记表示相同的元件。 Finally, wherever applicable, the same reference numerals denote the same elements. 图1描绘的横截面图显示了气密密封的0LED显示器10的基本组件的密封。  FIG 1 depicts a cross-sectional view showing a seal assembly substantially hermetically sealed 0LED display 10. 0LED显示器10包括第一玻璃基板12、一个或多个0LED14、玻璃料16和第二玻璃基板18的多层夹层结构。 0LED 12 includes display 10, one or more 0LED14, multilayer sandwich structure 16 and the second glass frit glass substrate 18 of the first glass substrate. 0LED显示器10包括由玻璃料16形成的气密密封20,保护位于第一玻璃基板12和第二玻璃基板18之间的0LED14。 0LED display 10 includes a hermetically sealed by glass frit 16 is formed 20, a second protective glass 12 and the substrate 18 0LED14 positioned between the first glass substrate. 气密密封20通常位于0LED显示器10的周界周围。 Hermetic seal is typically located around the perimeter 20 of the display 10 0LED. 0LED14位于气密密封20的周界之内。 0LED14 hermetic seal is located within the perimeter 20 of the. 下面将详细描述玻璃料16的组成，更具体说玻璃料16的玻璃组成以及如何由玻璃料16形成气密密封20。 The composition of the glass frit 16 will be described in detail below, more particularly glass composition of the glass frit 16 and how the material 16 is formed of a glass hermetic seal 20. 在一种实施方式中，第一和第二玻璃基板12和18是透明的玻璃板。  In one embodiment, the first and second glass substrates 12 and 18 is a transparent glass plate. 玻璃料16沿第二玻璃基板18的边缘沉积。 Frit glass 16 is deposited along the edge of the second substrate 18. 例如，离开第二玻璃基板18的自由边约1mm处设置玻璃料16。 For example, at about 1mm away from the glass frit 16 is provided consisting of the second glass substrate 18 side. 在优选的实施方式中，玻璃料16是低温含钒不含锑的玻璃料以提高玻璃料的吸光度。 In a preferred embodiment, the glass frit 16 is a low temperature glass frit-containing vanadium-antimony-free glass frit to improve the absorbance. 玻璃料16也可包含填料，例如β锂霞石或β-石英，其降低玻璃料的热膨胀系数(CTE)，使其匹配或基本匹配两炔基板12和18的CTE。 Glass frit 16 may also contain fillers, for example, β- or β-eucryptite crystal, which reduces the coefficient of thermal expansion (CTE) of the glass frit, CTE to match or substantially match the two substrates 12 and 18 alkynyl. 0LED14和其它电路沉积在第二玻璃基板18上。  0LED14 and other circuitry deposited on the second glass substrate 18. 常规的0LED14包括阳极电极、一个或多个有机层、和阴极电极。 Conventional 0LED14 includes an anode electrode, one or more organic layers, and a cathode electrode. 然而，容易理解，其它环境敏感组件也可能沉积到第二玻璃基板18上。 However, it readily appreciated that other environmentally sensitive components may also be deposited on the second glass substrate 18. 任选地，可将玻璃料16预烧结至第一玻璃基板12,然后将玻璃基板12和18密封到一起。  Optionally, the pre-sintered frit 16 to the first glass substrate 12, and then the sealing glass substrate 12 and 18 together. 为此，将其上沉积有玻璃料16的第一基板12在炉或烘箱中加热，使玻璃料16附着于第一玻璃基板12。 For this purpose, the substrate on which is deposited a first glass frit 16 is heated in a furnace or oven 12, a glass frit 16 is attached to the first glass substrate 12. 然后，用玻璃料16使第一和第二玻璃基板12和18以及其间设置的一个或多个0LED 结合到一起，玻璃料16由辐射源22 (例如激光或红外灯）照射，使得玻璃料16形成连接和粘结第一基板12和第二基板18的气密密封20。  Then, frit glass 16 of the first and second substrates 12 and 18 and one or more 0LED disposed therebetween are joined together, the frit 16 is irradiated by a radiation source 22 (e.g., laser or infrared light), such that glass frit 16 and a connection 12 hermetically bonding the first substrate and the second substrate 18 of the sealing 20. 气密密封20还可以防止周围环境中的氧气和水分进入0LED显示器10中，从而保护0LED14。 Hermetic seal 20 may also prevent ambient oxygen and moisture into 0LED display 10, thereby protecting 0LED14. 容易理解，照射波长应在特定玻璃料16的高吸收谱带之内。  readily understood that the material should be high irradiation wavelength absorption band 16 of a particular glass. 例如，可使用镱(900nm <λ〈1200ηπι)，Nd: YAG(X= l〇64nm)，Nd: YAL0(X = 1 ·〇8μπι)和铒(λ » 1 · 5ym)CW激光，这取决于具体玻璃料16和玻璃基板12和18的光学特性。 For example, a ytterbium (900nm <λ <1200ηπι), Nd: YAG (X = l〇64nm), Nd: YAL0 (X = 1 · 〇8μπι) and erbium (λ »1 · 5ym) CW laser light, depending 12 and 18, the optical characteristics of the particular glass frit and the glass substrate 16. 应注意，大多数传统低温密封玻璃料是PbO基的，因为PbO玻璃料具有良好的流动性和粘合性质。  It should be noted that most traditional low temperature sealing glass frit is a group of PbO, PbO as glass frit having good flowability and adhesion properties. 但是，本文所述的不含锑的玻璃料不仅具有低于PbO基玻璃料的CTE，还具有更好的水耐久性，以及就粘合而言可与传统的Pb基玻璃料相比拟。 However, antimony-free glass frit as described herein not only has a CTE lower than PbO-based glass frit, and also have better aqueous durability, as well as in terms of bonding to be compared with the conventional Pb-based glass frit proposed. 此外，虽然由于P205能够形成稳定的玻璃，P20 5在成功密封玻璃料中起着重要作用，但是从激光密封和密封后性能的角度，Sb2〇3和V2〇5不应被忽视。  Further, since while capable of forming a stable glass P205, P20 5 plays an important role in the successful sealing frit, but from the perspective of the laser sealing and sealing performance, Sb2〇3 V2〇5 and should not be ignored. V 2〇5基玻璃料和玻璃向来就具有低劣的水耐久性。 V 2〇5 group always on and the glass frit having poor aqueous durability. 在过去的测试中，用不含Sb、Zn基磷酸钒玻璃料制备的密封仅仅能够适应60 °C /40 % RH相对温和的环境，而由混合Sb-Zn磷酸钒玻璃料制成的密封能够适应60°C/85%RH而不失效。 In the last test, not containing Sb, Zn-based sealing the prepared vanadium phosphate glass frit can only accommodate a relatively modest 60 ° C / 40% RH environment, and a seal made of a Sb-Zn mixed vanadium phosphate glass frit can be adaptation 60 ° C / 85% RH without failure. 相反，只有用Sb-磷酸钒玻璃料制成的密封能够适应85°C/85%RH。 Instead, only Sb- material made of vanadium phosphate glass seal can accommodate 85 ° C / 85% RH. 然而，虽然Sb2〇3在改善水耐久性方面发挥作用，潜在用户的反馈一致地提升关于其存在的关注，因为锑是有毒元素。 However, while Sb2〇3 play a role in improving the durability of water, potential users of feedback consistently enhance the concerns about its existence, because antimony are toxic elements. 因此，最近的重点已置于开发适用于密封玻璃料且同时环境友好的玻璃。 Therefore, the recent focus has been to develop suitable for sealing glass frit and at the same time environmentally friendly glass is placed. 关于不含Sb203组合物的早期工作开始于首先将基础0LED装置密封玻璃料组合物表达为三组分系统，其包括锑、钒和磷的氧化物。  Early work on the free Sb203 composition begins by first means for sealing the base 0LED glass frit composition is expressed as a three-component system, which comprises an oxide of antimony, vanadium and phosphorus. 然后将这些组合物简化成两组分的不含Sb 2〇3系统，并基于它们对水耐久性、流动性、玻璃化转变温度(Tg)，和激光密封能力的影响来确定其它组分。 These compositions were then reduced to two components 2〇3 Sb-free system, and other components is determined based on their effect on transition of water durability, fluidity, glass transition temperature (a Tg of), and laser sealing ability. 任何备选玻璃料组合物的水耐久性、激光密封能力和流动性都需要与含Sb 2〇3的对照样品相比拟，且标准是Tg&须小于或等于400°(：。（对于在后续处理中可操作的0LED玻璃料而言，T g>400 °C的玻璃料在预烧结步骤器件不可能充分流动。）用于氧化锑(Sb2〇3)的潜在取代物是:W0 3，Mo03，Te02，Bi2〇3，Fe 2〇3，和Ti02。也研究了ZnO，虽然考虑到Zn〇-V2〇5-P2〇5玻璃料的耐久性结果较差，但认为其仅仅是次要组分(0-10%)以降低维持流动性。选择的各种氧化物是在它们与V2〇5形成稳定的二元玻璃的基础上进行选择的。 Alternatively, any aqueous durability of the glass frit compositions, and the laser sealing ability are required flowability compared to the control sample containing the quasi 2〇3 Sb, and Tg & criteria must be less than or equal to 400 ° (:. 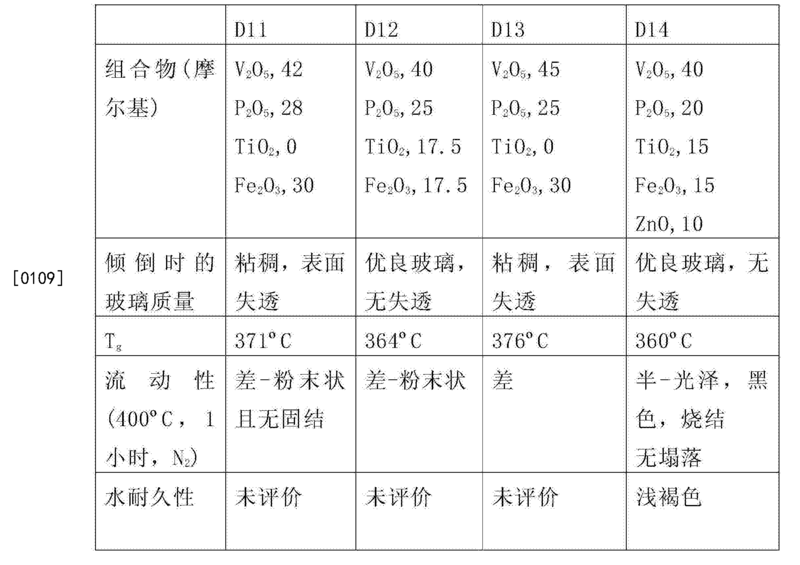 (For subsequent processing in operative terms 0LED frit, T g> 400 ° C the glass frit can not flow sufficiently at the provisional sintering step of the device) for antimony oxide (Sb2〇3) potential substituents are:. W0 3, Mo03, TE02, Bi2〇3, Fe 2〇3, and Ti02. also studied ZnO, although given the poor Zn〇-V2〇5 P2〇5 frit-durability results, it is believed that it is only a minor component (0-10%) to lower the fluidity is maintained. choose various oxides are selected on the basis of binary glasses are formed on a stable and V2〇5. 熔融各组合物，倾倒作为玻璃饼片，然后进行球磨以形成精细颗粒玻璃料(通常d50 为约3-约5μπι)。  Each melt composition pouring a glass pie plate, and then ball milled to form fine particles of glass frit (d50 typically about 3 to about 5μπι). 所有组成表达为摩尔百分数(摩尔％ )，所有的温度是摄氏度（°C)。 All components are expressed as mole percent (mol%), and all temperatures are in degrees Celsius (° C). 筛选不同组合物的关键实验室测试是制备并烧制各种玻璃料的流动圆片，然后评估其水耐久性。 Screening of different composition is a flow key lab test wafer was prepared and fired various glass frit, and then assess their aqueous durability. 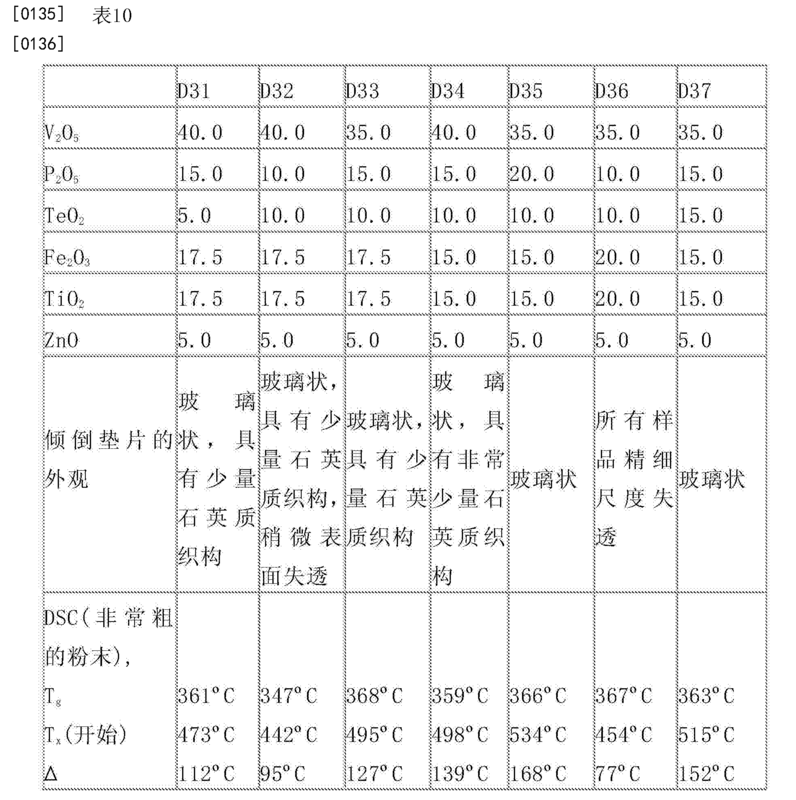 将流动圆片在氮气(N 2)气氛中烧制到约400°C-约450°C的温度(取决于Tg和结晶趋势）。 Flowing wafer calcined at (N 2) nitrogen to a temperature of about about 400 ° C- 450 ° C (depending on the Tg and the crystallization tendency). 烧制后，将流动圆片浸没到90°C去离子水中保持48小时以评估其水耐久性。 After baking, the wafer is immersed into the flow of deionized water 90 ° C for 48 hours to assess their aqueous durability. 每次评估也包括0LED玻璃料的对照样品(D1基础玻璃-见表1，或者是70:30D1基础玻璃与β-锂霞石填料的掺混物）。 Each evaluation also included a control sample 0LED glass frit (D1 base glass - see Table 1, or 70: 30D1 base glass and β- eucryptite filler blend). 研究的Sb 2〇3的潜在替代品中（如上所述），仅Ti02和Fe2〇3有希望。 Sb 2〇3 of potential alternatives studied (as described above), only Ti02 and Fe2〇3 there is hope. 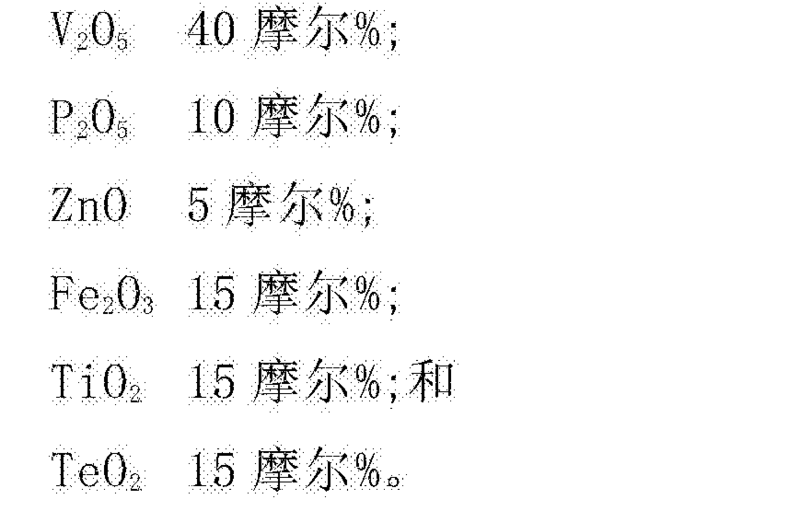 表1 和2列出了50 摩尔％V2〇5-30 摩尔％P2〇5 组合物系列与W〇3，Mo〇3，W〇3+ZnO，Bi2〇3 和Te02作为第三组分的结果。  Tables 1 and 2 shows the mol% 50 mol% V2〇5-30 P2〇5 of compositions with W〇3, Mo〇3, W〇3 + ZnO, Te02, and a third group Bi2〇3 the results points. 也显示了含Sb 2〇3的标准0LED基础玻璃D1作为对照标准品的结果。 The results also show the standard 2〇3 Sb-containing base glass 0LED D1 as a control standard. 为由倾倒物形成的玻璃质量，评价所有组合物（以摩尔％表示），用差示扫描量热法(DSC)测定的玻璃化转变温度(T g)，3μπι粉末手动压制形成丸粒（"流动圆片"）并在他中400°〇烧制1小时的流动性和可烧结性，以及在上文所述实验室水耐久性测试中测定水耐久性(根据经烧制的流动圆片样品上清液的颜色测量一颜色较深则样品耐久性较差）。 Formed by pouring glass quality evaluated all compositions (expressed in mol%), by differential scanning calorimetry (DSC) measurement of the glass transition temperature (T g), 3μπι manually pressed powder pellet form ( " flow wafer ") square and fired 400 ° for 1 hour and sinterability flowability, and durability tests measured the water above his lab durability in water (according to the flow of the fired discs a sample supernatant darker color measurement sample is poor durability). 注意:表1和2 列出的所有潜在的Sb 2〇3替代品均未能产生含Sb2〇3的对照所表现出的可接受水平的玻璃质量，T g，流动性和水耐久性(根据90°C温度下去离子水中48小时之后上清液的外观判断）。 Note: in Table 1 and all potential alternatives 2〇3 Sb 2 listed are failed to produce a control containing Sb2〇3 exhibited an acceptable level of quality of the glass, T g, the fluidity and the durability of water (according to after a temperature of 90 ° C in deionized water 48 hours supernatants appearance determination). Fe2〇3和/或Ti02代替Sb2〇3的不含Sb2〇3的磷酸钒玻璃料得到更加积极的结果(参见下文的表3和4)。  Fe2〇3 and / or replaced Ti02 Sb2〇3 vanadium phosphate glass frit obtained free Sb2〇3 more positive results (see Tables 3 and 4 below). 所有组合物以摩尔％表示。 All compositions expressed in mole%. 一些Fe2〇3+Ti〇2的组合在倾倒时产生优良的玻璃。 Some combinations generated Fe2〇3 + Ti〇2 excellent glass pouring. 诸如D8的高Ti0 2的玻璃（即2 25%)具有可接受的Tg和流动特性，但水耐久性较差。 Such as high glass D8 Ti0 2 (i.e. 225%) having a Tg and acceptable flow properties, but poor aqueous durability. 诸如D7和Dll的高Fe2〇3玻璃（即2 25或30%)倾向于在倾倒时产生较差的玻璃，如显著的表面失透所证明。 Such as high glass Fe2〇3 Dll and D7 (i.e., 30% or 225) tends to produce poor when pouring a glass, such as significant surface devitrification demonstrated. 这些玻璃较差的稳定性(倾倒时圆片形成大量表面失透)导致玻璃料较差的流动性。 The poor stability of the glass (form a large pouring the wafer surface devitrification) results in poor fluidity glass frit. 相对于氧化状态它们也倾向于不稳定，在相同的烧制条件下，相同批次粉末形成的经烧制的流动圆片交替出现黑色(还原）或是红色(氧化）。 With respect to the oxidation state they tend to be unstable, under the same firing conditions, the fired wafers same batch flow formed alternately appear black powder (reduction) or red (oxidation). 表4还包括D14,该玻璃中Fe 2〇3和Ti02 含量较高但含10摩尔％ZnO以降低Fe2〇3导致的Tg的预期升高。 Table 4 further comprising D14, the higher the glass and Fe 2〇3 Ti02 content but containing 10 mole% ZnO Fe2〇3 expected to lower the Tg of the resulting increased. 注意，调节高含量Fe 2〇3的第二种方法是增加V2〇5的含暈。 Note that, adjusting the high Fe content 2〇3 second method is to increase V2〇5 containing halo. 伹是如D9和D10所示，较高的V 2〇5含暈时水耐久性受损。 Qu D9 and D10 are as shown in impaired durability at higher water 2〇5 containing V halo. 还应注意，虽然P2〇5水平等于或大于25摩尔％的表3和4的测试样品性能较差，但预期可成功采用小于25摩尔％的？  It should also be noted that although P2〇5 level greater than or equal to 25 mol% in Table 3, and poor performance of the test sample 4, but is expected to be successfully employed less than 25 mol% of? 2〇5水平。 2〇5 level. 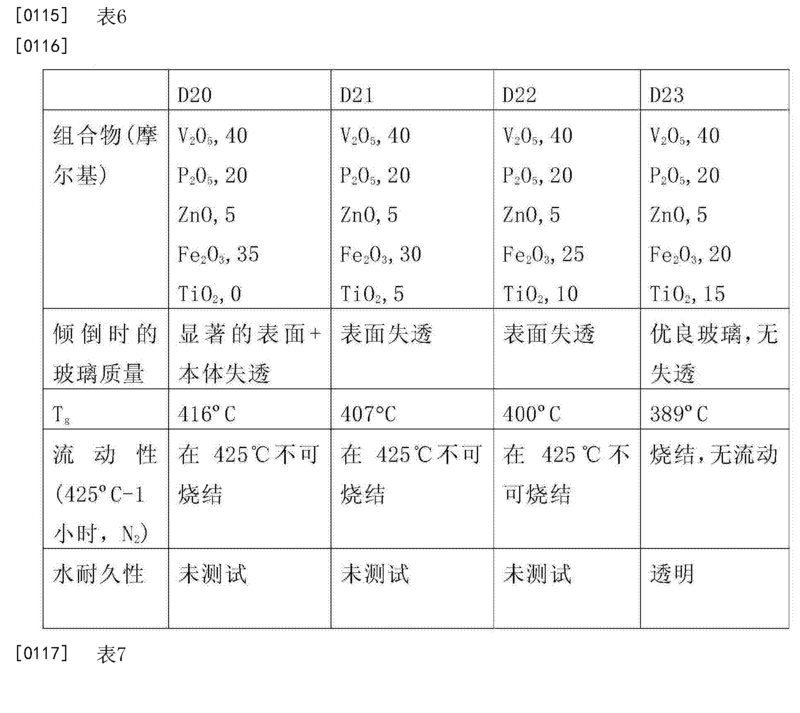 表5总结了10%Zn0时第二组Fe2〇3和Ti02熔体的结果。 Table 5 summarizes the results of the second group 10% Zn0 and Ti02 Fe2〇3 melt. 所有组合物以摩尔％表不。 All compositions in mole% Table no. 相对于最初的系列，优选Fe2〇3和Ti〇2的一些组合，因为Fe2〇3 有利于优异的水耐久性(代价是高!^和400°(：时降低的玻璃料烧结），且Ti0 2能够降低1^和改善流动性(代价是水耐久性）。 With respect to the first series, and preferably some combination Fe2〇3 Ti〇2 because Fe2〇3 facilitate excellent aqueous durability (high expense and ^ 400 ° (:! Decreases the glass frit), and Ti0 ^ 1 and 2 can be reduced to improve the flowability (at the expense of water durability). ZnO维持在5摩尔％，以较高的[Fe203+Ti02]浓度制备另一系列的熔体(参见表6和7)。  ZnO is maintained at 5 mole%, a higher [Fe203 + Ti02] Another series of melt prepared at a concentration (see Table 6 and 7). 所有组合物以摩尔％表示。 All compositions expressed in mole%. 注意:为适应高含量Fe203玻璃较高的Tg，在425°C而不是先前采用的400 °C评价流动性。 Note: In order to meet the higher content of high Fe203 glass Tg, at 425 ° C instead of 400 ° C used in the previous evaluation of flowability. 如先前表1、2和3、4的结果所示，Fe2〇3浓度并不显著高于20摩尔％ (例如，约25摩尔％)导致玻璃料具有较高的!^，较差的稳定性以及在400-425°C烧结时不可接受的流动性。  As previously shown in Table 2 and the results of 3,4, Fe2〇3 concentration not significantly higher than 20 mol% (e.g., from about 25 mol%) having a high lead glass frit! ^ Poor stability and flowability unacceptable 400-425 ° C when sintered. 类似地，Ti02不比20摩尔％高太多(例如约25摩尔％ )，导致玻璃料具有可接受的Tg，流动性和稳定性，但具有不可接受的水耐久性。 Similarly, Titania and much higher than 20 mol% (e.g. about 25 mole%), resulting in a glass frit having a Tg of acceptable, fluidity and stability, but with unacceptable water durability. Fe2〇3水平约为10到小于25摩尔％，Ti〇2水平约为15到小于25摩尔％ (5-10摩尔％的211〇)的玻璃料结合了优异的水耐久性以及可接受的流动性、Tg和玻璃稳定性。 Fe2〇3 level of about 10 to less than 25 mol%, Ti〇2 level of about 15 to less than 25 mole% (mole% of 5-10 211〇) glass frit combined with excellent water durability and acceptable flow resistance, Tg and the glass stability. 发现(Fe2〇3+Ti〇2+ZnO)、不含Sb2〇3的V2O5-P2O5玻璃料的水耐久性相当于或稍优于含Sb2〇3的标准组合物。  found that (+ Fe2〇3 Ti〇2 + ZnO), water durability, V2O5-P2O5-free glass frit Sb2〇3 equivalent or slightly better than a standard composition containing Sb2〇3. 不含Sb2〇3的研究的意外结果是较高含量Fe2〇3时(Fe 203+Ti02+Zn0)玻璃料的热膨胀系数(CTE)显著降低。 Unexpected results of the study are free Sb2〇3 (Fe 203 + Ti02 + Zn0) thermal expansion coefficient of the glass frit (CTE) significantly reduced Fe2〇3 content is high. 图2所示的是组成如表3、4和5所示的经烧结的玻璃料的CTE数据。 Is a composition shown in Table 3, 4 and 5 shown in sintered glass frit CTE data shown in FIG. 列出了表3、4的20摩尔％ (Fe2〇3+Ti〇2)系列（曲线120)和表5的35摩尔％ (Fe2〇3+ Ti02)系列（曲线122)中所有可烧结玻璃料的数据。 Table 20 lists the mole% of 3,4 (Fe2〇3 Ti〇2 +) series (curve 120) and 35 mol% Table 5 (Titania and Fe2〇3 +) sintered frit all series (curve 122) The data. 将经烧结的玻璃料棒的CTE数据与每个系列中的Fe2〇3水平作图，一直到20摩尔％Fe2〇3，20摩尔％Fe2〇3是实现具有优良可烧结性和氧化稳定性的玻璃料的表观上限。 The sintered glass frit bars CTE Fe2〇3 level data plotted in each series, up to 20 mol% mol% Fe2〇3 Fe2〇3,20 achieve excellent sinterability and oxidative stability the upper limit of the apparent glass frit. 注意：CTE值在0摩尔％Fe 203/最大Ti02(分别是20和35摩尔％ )时最高，随着Fe2〇3含量增加基本上维持在60-65xl(T7/°C，然后在Fe2〇3>15摩尔％时显著降低(分别是5摩尔％和20摩尔％Ti〇2)，在17.5-20摩尔％?62〇3时达到约4(^10- 7/°(：的值。 通过比较，含Sb2〇3的基础玻璃料的CTE约为70-80xl(T 7/°C。 Note: CTE value of 0 mol% Fe 203 / Titania and maximum (respectively 20 and 35 mol%), the highest, as the content increases substantially maintained Fe2〇3 60-65xl (T7 / ° C, and then Fe2〇3 > 15 mol%, a significant reduction (respectively 5% and 20 mol% Ti〇2 mol) in 62〇3 17.5-20 mol% when up to about 4 (^ 10- 7 / ° (:?. 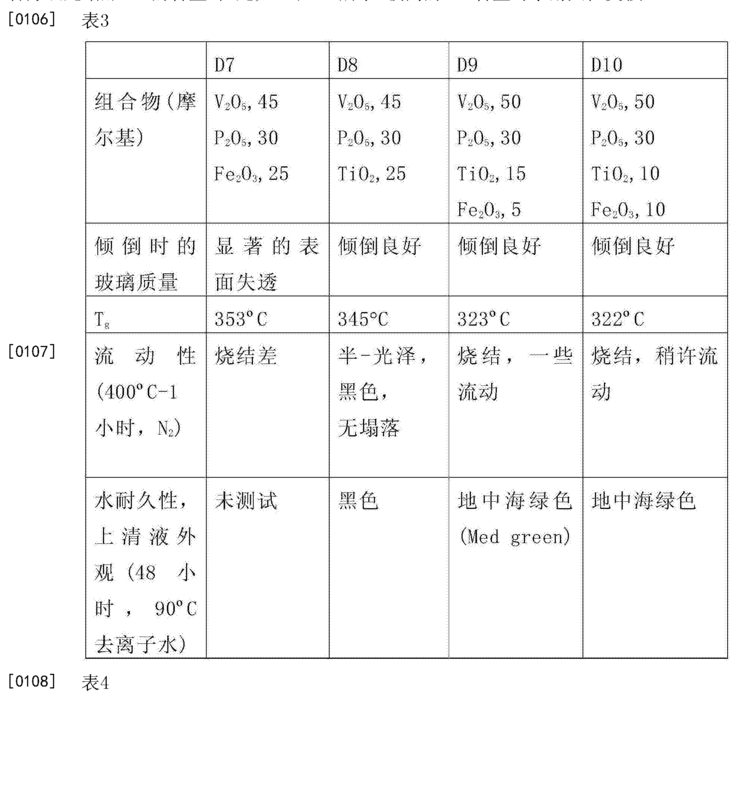 by comparing the values , CTE base glass frit containing Sb2〇3 about 70-80xl (T 7 / ° C.
图3显示了含Sb2〇3和不含Sb2〇3的玻璃料之间CTE更直接的比较结果，绘制D1在加热和冷却条件下（分别是曲线124和126)，D29(D24的再恪体，表7)在加热和冷却条件下（分别是曲线128和130)的CTE曲线。  Figure 3 shows a more direct comparison result of CTE between the glass frit of containing Sb2〇3 and without Sb2〇3, D1 drawn under heating and cooling conditions (curves 124 and respectively 126), D29 (D24 in Ke body again, table 7) under heating and cooling conditions (curves 128 and 130, respectively) of the CTE curve. 无填料的玻璃料的CTE值约为40x 1 0-V °C，可能的话，添加诸如β-锂霞石或β-石英的填料将玻璃料的CTE值降低至接近熔融石英的水平。 CTE values ​​unfilled frit is about 40x 1 0-V ° C, if possible, such as adding or β- β- eucryptite filler quartz glass frit CTE values ​​will be reduced to a level close to the fused silica. 在包括激光密封的样品于85 °C /85 % RH接触的大规模密封试验中确认了对不含Sb 的玻璃料进行的实验室规模的水耐久性结果。  In a large-scale seal test sample comprises laser sealing at 85 ° C / 85% RH was confirmed that the water is in contact durability results of laboratory scale Sb-free frit performed. 表8显示了标准0LED玻璃料(D1，表1;70:30的D1与降低CTE的填料β-锂霞石的掺混物)和不含Sb的玻璃料(D29，D24的再熔体，表7;80:20 重量比的D29与降低CTE的填料β-石英的掺混物）的试验和比较。 Table 8 shows the standard 0LED glass frit (D1, Table 1; 70: D1 β- eucryptite filler and decrease the CTE blend 30) and Sb-free frit (D29, D24 re-melt, table 7; 80: D29 20 weight ratio and a CTE reducing filler β- quartz blend) are tested and compared. 将各玻璃料共混物制备成浆料，分配在几片EAGLE xg显示器玻璃上，其中一片玻璃片包括沉积其上的薄膜作为气密性的指示剂，预烧结(含Sb标准物，在空气中于325 °C下保持2小时然后在N2中于400 °C下保持1 小时；不含Sb的，在空气中于325°C下保持2小时然后在N2中于425°C下保持1小时），密封到EAGLE X(^，置于85Γ/85%相对湿度环境腔室，以及随后周期性检查是否有密封泄漏和Ca金属击穿的证据。总体而言，本试验包括3片含Sb的对照组合物和7片不含锑的组合物，每片具有9个钙(Ca)金属垫片的密封阵列。 Each glass frit slurry was prepared as a blend, partitioned from the few EAGLE xg display glass, wherein the glass comprises depositing a film on which an indicator as airtightness, pre-sintered (Sb-containing standards, air held at 325 ° C 2 h and then kept in N2 at 400 ° C 1 h; and held for 2 hours at 325 ° C in air containing no Sb in N2 and then held at 425 ° C 1 hours ), sealed to the EAGLE X (^, placed 85Γ / 85% relative humidity chamber, and then periodically check for evidence of Ca metal seal leakage and breakdown. in general, this test comprises three Sb-containing seven control composition and antimony-free composition, each sheet having nine calcium (Ca) metal sealing gasket array. 如表8所示，Sb对照和不含Sb的玻璃料均有一些阵列在密封后立即失效或者在将它们置于85°C/85%RH室中100小时之内失效，其中失效通过钙垫片的可见氧化来指示;这些结果最有可能与每种玻璃料中随机存在的污染等总体缺陷有关。  As shown in Table, the control Sb Sb-free frit and 8 are some of the array fail immediately after sealing or placing them in 85 ° C / 85% RH chamber failure of 100 hours, wherein the invalid calcium oxide is indicated by the visible gasket; these results are most likely to overall pollution defects present in each random related frit. 然而，96小时后，Sb对照或不含Sb的玻璃料密封均未观察到额外的失效。 However, 96 hours later, control or Sb Sb-free frit seal failures were not observed in the additional. 通过用Fe203+Ti02的组合代替氧化锑而不含Sb20 3,同时加入少量ZnO以维持流动性和玻璃化转变温度(Tg)，维持了Sb-磷酸钒玻璃料优异的水耐久性性能。  but excluding Sb20 3 by replacing antimony with the composition Fe203 + Ti02, while adding a small amount of ZnO to maintain flow and glass transition temperature (a Tg of), Sb- maintained excellent aqueous durability vanadium phosphate glass frit performance . 发现Fe2〇3的存在对改善耐久性的影响最大。 Fe2〇3 found to affect the existence of the improvement of the durability of the largest. 然而，如果大量，这会提高T g，从而降低密封期间玻璃料的流动性。 However, if a large amount, which increases the T g, thereby reducing the fluidity of the frit during the sealing. 此外，具有高含量Fe2〇3的玻璃料(等于或大于约25摩尔％ )易于氧化不稳定，相同方案(425 °(：，犯中）重复样品烧制显示不同的颜色（褐色或黑色），并且流动性存在显著差异。虽然加入1^ 〇2实际上会在一定程度上降低水耐久性，但是从获得具有高的水耐久性和低1^( < 400°)的角度出发，（Fe2〇3+Ti02)的组合似乎是一种理想的组合。 Further, having a high content of the glass frit Fe2〇3 (equal to or greater than about 25 mole%) readily oxidatively unstable, the same program (425 ° (:, sins) duplicate samples fired to display different colors (brown or black), and there is a significant difference in flow properties. While the addition of 1 ^ 〇2 actually reduce the durability of the water to a certain extent, but from water having a high durability and low 1 ^ (<400 °) angle, (Fe2〇 Titania and the combination of + 3) appears to be an ideal combination. 激光密封样品在90 °C蒸馏水的实验室测试以及85 °C /85 %相对湿度(RH)环境室中的测试表明，基于Fe2〇3-Ti02-Zn〇-V 2〇5-P2〇5系统的玻璃料在激光密封后能够形成气密密封，在延长的时间内承受高的湿度条件U 1000小时）。  Laser sealing samples in 90 ° C distilled water, and laboratory testing 85 ° C / 85% relative humidity (RH) environmental chamber testing shows that Fe2〇3-Ti02-Zn〇-P2-V based 2〇5 〇5 frit seal after laser system capable of forming a hermetic seal under high humidity conditions over a prolonged period of time U 1000 hours). 卬62〇3+1^02)代替Sb2〇3的意外结果是，不含填料的不含Sb的玻璃料的CTE降低约一半（从70-80xl(T7/°C降至35-45xl(T 7/°C)， 而仏仅稍微增加(从355°C提高至370°C)。添加降低Tg的填料例如β-锂霞石或β-石英，CTE值接近40xl(TV°C的玻璃料具有能够密封熔融石英和其它低CTE基材如Kovar™的潜力。 Ang 62〇3 + 1 ^ 02) in place Sb2〇3 unexpected result, CTE Sb-free frit containing no filler is reduced by about half (from 70-80xl (T7 / ° C down to 35-45xl (T 7 / ° C), and Fo is only slightly increased (from 355 ° C to 370 ° C). was added to lower the Tg of fillers such as quartz β- or β- eucryptite, CTE values ​​close 40xl (TV ° C glass frit It can be sealed with fused silica and other low CTE substrates such as Kovar ™ of potential. 如上所述，虽然Fe203的存在产生有利的CTE，但是Fe20 3的确作用于增加1^。  As described above, although the presence of the CTE of Fe203 produces advantageous, but does act on the increase Fe20 3 ^ 1. 虽然ZnO 和Ti02在某种程度上抵消Fe2〇3升高Tg的作用，但它们也趋于降低对水性攻击的耐受性。 Although ZnO and Ti02 offset Fe2〇3 elevated Tg role to some extent, but they also tend to reduce resistance to water attacks. 为了获得Tg相当于或小于含Sb对照D1的不含Sb组合物，进一步研究了P205的作用。  In order to obtain a Tg equal to or less than the composition containing Sb Sb-free controls D1, and further studied the role of P205. 如上所述，P2〇5 (玻璃形成剂)用于增加玻璃料的玻璃稳定性，因此当以低浓度存在时，钒-锑玻璃易于快速结晶。 As described above, P2〇5 (glass formers) for increasing the stability of the glass frit glass, so that when present in low concentrations, vanadium - antimony easily and quickly crystallized glass. 因此，将D24用作起点，并至少部分地用不同的低Tg玻璃形成剂例如Te0 2或Bi2〇3来置换P2〇5。 Accordingly, the D24 is used as a starting point, at least in part and replaced with a different low Tg P2〇5 glass formers or Bi2〇3 e.g. Te0 2. 如上所述，使用Te作为锑的替代品（例如样品D6)不趋于得到适用于玻璃料的玻璃。 As described above, using Te as a substitute for antimony (e.g. a sample D6) does not tend to give a glass frit applied to the glass. 但是，当与用Fe 2〇3和Ti02取代锑组合时，结果意料之外的有利于Tg。 However, when the Fe 2〇3 and Ti02 substituted with a combination of antimony, unexpected results favor Tg. 下文的表9显示了两个不含Sb玻璃料的实施例，D29和D30,使用部分地Te0 2或Bi2〇3取代P2〇5。 Table 9 below shows an embodiment, D29 and D30 two Sb-free frit used Bi2〇3 or partially substituted P2〇5 Te0 2. 所有组合物以摩尔％表示。 All compositions expressed in mole%. 在没有盖子的氧化硅坩锅中熔融各样品的批料，在空气中于l〇〇〇°C下保持1小时，取出，在第二个坩锅中混合，然后倾倒至金属板上。 Melting silica crucible without a lid of the batch in each sample, held in air at l〇〇〇 ° C 1 hour, remove, in a second mixing crucible and then poured into a metal plate. 如表9所示，用Te02部分取代P205得到良好质量的玻璃，与不含Sb/P 205样品D24相比，它的Tg下降了30°C，而类似地用Bi2〇3进行取代不能制备可接受的玻璃。  As shown in Table 9, section Te02 substituted with P205 to obtain good quality glass, as compared with free Sb / P 205 samples D24, it decreased Tg 30 ° C, and similarly the substitution with Bi2〇3 acceptable glass can not be prepared. 029的1^和结晶开始(Tx)之间接近80 °C的间隔表明含Te02的玻璃，例如样品D29的玻璃是适用于玻璃料的性能良好的玻璃。 Close to 80 ° C between the start (Tx) 029 1 ^ Te02 and crystallized glass containing spacer indicate, for example, a sample D29 is applied to the glass frit glass good performance. 但是据信在样品30中存在的小于10摩尔％的量的Bi 2〇3例如0-9摩尔％、0-7 摩尔％，或0-5摩尔％是合适的。 However, the amount of data is less than 10 mol% present in the sample channel 30 mol% Bi 2〇3 e.g. 0-9, 0-7 mole%, or 0-5 mol% is suitable. 使用D24作为起点，制备了其它Te02-取代_P205替代，来测定P 205置换对所得玻璃料的选定性质的影响，且结果见表10。  D24 used as a starting point, other Te02- substituted _P205 Alternatively, measured P 205 exchange on the selected properties of the resulting glass frit, and the results are shown in Table 10 was prepared. 所有组合物以摩尔％表示。 All compositions expressed in mole%. 与D24相比，具有表10所示的Te02-取代_P205替代的各玻璃都显示Tg降低。 Te02-  Compared with D24, as shown in Table 10 having alternative substituents each glass _P205 show reduced Tg. 具有最佳稳定性(即，最少量的可察觉的失透和最高的Δ，其中德塔(Delta)即Δ是TdPT x之间的温差）的玻璃例如D34，D35和D37，包括65%玻璃形成剂（即，V2〇5+P2〇5+Te02)，而具有最差玻璃稳定性的玻璃(D36)包括减少量的玻璃形成剂(55% )。 Glass has the best stability (i.e., minimum amount perceptible devitrification and the highest [Delta], wherein Datacolor (of Delta) i.e. 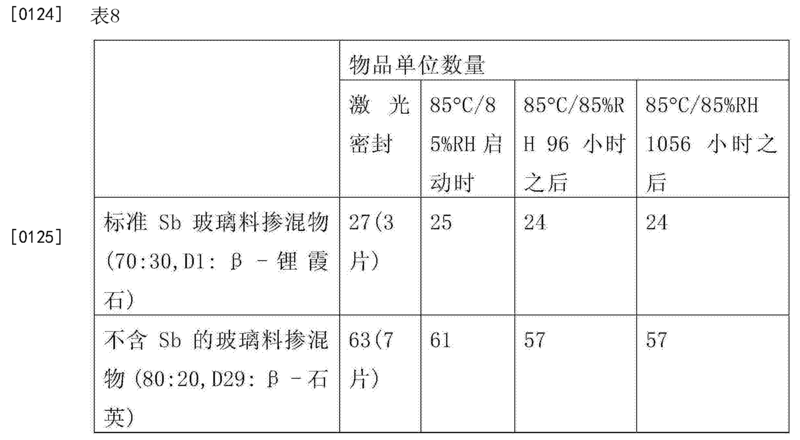 [Delta] is the temperature difference between the TdPT x), for example D34, D35 and D37, a glass comprising 65% forming agent (i.e., V2〇5 P2〇5 + + TE02), and glass (D36) having the worst glass stability include reduced amounts of glass-forming agent (55%). 只有表11的D38到D41的玻璃熔融。  Table 11 is only a glass melting and D41 to D38. D38到D41的玻璃全部包括玻璃形成剂总量浓度2 60% (V2〇5+P2〇5+Te02)。 D38 to D41 all glass comprising a glass forming two total concentration of 60% (+ V2〇5 P2〇5 + Te02). 但是，甚至在高浓度玻璃形成剂时，需要极少量的P 2〇5来取得良好的玻璃稳定性（例如比较D40相对于D39和D41)。 However, even at high concentrations of the glass forming agent, a very small amount of P 2〇5 to achieve good glass stability (e.g., with respect to Comparative D40 and D39 D41). 结果表明P2〇5在稳定V2〇5含量为约30-约50 %的钒玻璃中的有效作用。 The results showed that effective action from about 30 to about 50% vanadium glass P2〇5 stable V2〇5 content. 图4和5所示的是小型水耐久性测试的图片，其中将玻璃料丸在90°C下置于去离子H20中保存48小时，然后基于所得上清液的外观评估对水侵袭的耐受性。 Is  shown in FIGS. 4 and 5 small water durability test image, wherein the glass frit is placed in deionized H20 pellets stored for 48 hours at 90 ° C, and the resulting supernatant was based on assessment of the appearance of water invasion of tolerance. 测试中包括的显示在标记为132的烧杯中的含Sb玻璃料、显示在标记为134的烧杯中的不含Sb的玻璃料D24、以及显示在标记为136的烧杯中的D32和显示在标记为138的烧杯中的D40的两种含Te02组合物。 Testing included in the tag display frit glass beaker containing Sb in 132, 134 displayed in a beaker labeled in Sb-free frit D24, and D32 in a beaker labeled display 136 and display the tag Te02-containing composition 138 into two beaker of D40. 图4和5所示的所有样品都是在相同方案下烧结(在空气中于325°C下保持1小时然后在N2中于400°C下保持1小时）。 All samples shown in FIGS. 4 and 5 are sintered at the same embodiment (1 hour at 325 ° C in air and then held in N2 at 400 ° C 1 hour). 从水耐久性的角度看，与组合物D1和/或D24中任一个相比，D32 和D40的性能是有利的。 From the perspective of the water durability, compared with a composition D1 and / or in any one of D24, D32, and D40 is advantageous properties. 图6描绘了用于D40的DSC曲线。  Figure 6 depicts a DSC curve for the D40. 在小型筛选测试中，Tg低至338°C、以及合理的仏和Tx(开始)之间104°C的德塔（△)、以及优异的水耐久性使得这种玻璃料成为吸引人的不含Sb密封玻璃料，用于密封激光密封的玻璃封装件例如可用于0LED显示设备的那些。 In the screening test, small, Tg as low as 338 ° C, and a reasonable Fo and between Tx (Start) Deta (△), and excellent durability of water 104 ° C makes this glass frit does not become attractive Sb sealed glass package containing glass frit for sealing the laser sealing may be used, for example, those 0LED display device. 取决于应用，可将增加或降低CTE的CTE改性填料适当地添加到由本文所述的玻璃制成的玻璃料组合物。 Depending on the application, it may increase or decrease CTE CTE suitably modified filler added to the glass frit made of glass composition as described herein. 虽然参照附图以及前面的详细描述说明了本发明的一些实施方式，但是应理解， 本发明不限于揭示的实施方式，在不偏离由以下权利要求书限定的本发明的精神下能够进行各种重排、修改和替换。  While the foregoing description with reference to the accompanying drawings and the detailed description of some embodiments of the present invention, it is to be understood that the present invention is not limited to the disclosed embodiment, it is possible without departing from the present invention is defined by the following claims spirit numerous rearrangements, modifications and substitutions. 1. 一种不含锑的玻璃，其包括： V2〇5> 30 和<60 摩尔％; P2〇5 2 5摩尔％和< 20摩尔％ ; ZnO 0-10摩尔％; Bi2〇3 0-5摩尔％; Fe2〇3 M0摩尔％和仝25摩尔％ ; Ti02 2 5摩尔％和< 20摩尔％ ; Te02 2 5摩尔％和< 20摩尔％ ;和其中，Ti02+Fe2〇3的范围是20摩尔％到35摩尔％。 An antimony-free glass, comprising: V2〇5> 30 and <60 mol%; P2〇5 25 mol% and <20 mol%; ZnO 0-10 mol%; Bi2〇3 0-5 mol%; mol% Fe2〇3 M0 with 25 mole%; Ti02 2 5 mole% and <20 mol%; Te02 2 5 mole% and <20 mole%; and wherein, Ti02 + range is 20 mole Fe2〇3 % to 35 mol%. 2. 如权利要求1所述的不含锑的玻璃，其特征在于： ¥2〇5 2 30和<40摩尔％;和P2O5 2 5摩尔％和< 15摩尔％。 2. 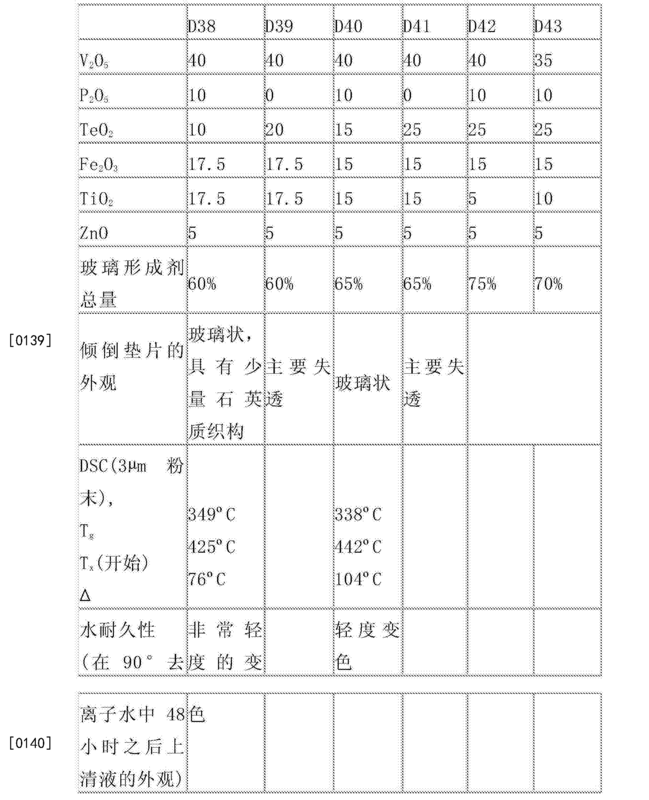 The antimony-free glass according to claim 1, wherein: ¥ 2〇5 230 and <40 mol%; and P2O5 2 5 mole%, and <15 mol%. 3. 如权利要求1所述的不含锑的玻璃，其特征在于： V2O5 2 35摩尔％和< 40摩尔％ ; P2〇5 2 8摩尔％和< 10摩尔％ ;和ZnO 2 3摩尔％和< 7摩尔％。 3. The antimony-free glass according to claim 1, wherein: V2O5 2 35 mol% and <40 mol%; P2〇5 28 mol% and <10 mol%; and 23 mol% ZnO and <7 mol%. 5. 如权利要求1所述的不含锑的玻璃，其特征在于，所述不含锑的玻璃的!^ < 350°C。 The antimony-free glass as claimed in claim 1 350 ° C, characterized in that the antimony-free glass! ^ <. 6. 如权利要求1所述的不含锑的玻璃，其特征在于，所述不含锑的玻璃包括玻璃料。 The antimony-free glass as claimed in claim 1, wherein the antimony-free glass comprising a glass frit. 7. 如权利要求6所述的不含锑的玻璃，其特征在于，所述玻璃料还包括降低CTE的填料。 7. The antimony-free glass according to claim 6, wherein said glass frit further comprises a CTE reducing filler. 8. -种玻璃封装件，其包括： 第一玻璃板； 第二玻璃板;和玻璃料，其连接第一玻璃板和第二玻璃板并在其间形成气密密封，该玻璃料包括不含锑的玻璃，该玻璃包括： V2〇5> 30 和<60 摩尔％; P2O5 2 5摩尔％和< 20摩尔％ ; Zn0>0和< 10摩尔％; Bi2〇3>0和<5摩尔％; Fe2〇3 M0摩尔％和仝25摩尔％ ; Ti02 2 5摩尔％和< 20摩尔％ ; Te02 2 5摩尔％和< 20摩尔％ ;和其中，Ti02+Fe2〇3的范围是20摩尔％到35摩尔％。 8. - kind of the glass package, comprising: a first glass sheet; a second glass plate; and a glass frit, which connects the first glass plate and a second glass plate and form a hermetic seal therebetween, the frit including none antimony glass, the glass comprising: V2〇5> 30 and <60 mol%; P2O5 2 5 mole% and <20 mol%; Zn0> 0 and <10 mol%; Bi2〇3> 0 and <5 mol%; Fe2〇3 M0 mol% with 25 mol%; Ti02 2 5 mole% and <20 mol%; Te02 2 5 mole% and <20 mole%; and wherein, Ti02 + Fe2〇3 range is 20 to 35 mol% mol%. 9. 如权利要求8所述的玻璃封装件，其特征在于： ¥2〇5 2 30和<40摩尔％;和P2O5 2 5摩尔％和< 15摩尔％。 9. The glass package according to claim 8, wherein: ¥ 2〇5 230 and <40 mol%; and P2O5 2 5 mole%, and <15 mol%. 10. 如权利要求8所述的玻璃封装件，其特征在于： V2O5 2 35摩尔％和< 40摩尔％ ; P2〇5 2 8摩尔％和< 10摩尔％ ;和ZnO 2 3摩尔％和< 7摩尔％。 10. The glass package according to claim 8, wherein: V2O5 2 35 mol% and <40 mol%; P2〇5 28 mol% and <10 mol%; mol% and ZnO 2 3 and <7 mol%. 11. 如权利要求8所述的玻璃封装件，其特征在于，所述不含锑的玻璃的!^ < 350°C。 11. The glass package according to claim 8 350 ° C, wherein the antimony-free glass! ^ <. 12. 如权利要求8所述的玻璃封装件，其特征在于，所述玻璃料包括降低CTE的填料。 12. The glass package according to claim 8, wherein the frit comprises a CTE reducing filler. 13. 如权利要求8所述的玻璃封装件，其特征在于，该玻璃封装件还包括设置在第一和第二玻璃板之间的有机材料。 13. The glass package according to claim 8, characterized in that the package further comprises a glass disposed between first and second glass sheets organic material. 14. 如权利要求13所述的玻璃封装件，其特征在于，所述有机材料包括有机发光二极管。 14. The glass package according to claim 13, wherein said organic material comprises an organic light emitting diode. 15. -种玻璃料，其包括： V2〇5> 30 和<60 摩尔％; P2O5 2 5摩尔％和< 20摩尔％ ; Zn0>0和< 10摩尔％; Bi2〇3>0和<5摩尔％; Fe2〇3 M0摩尔％和仝25摩尔％ ; Ti02 2 5摩尔％和< 20摩尔％ ; Te02 2 5摩尔％和< 20摩尔％ ;和其中，Ti02+Fe2〇3的范围是20摩尔％到35摩尔％。 15. - glass frits, comprising: V2〇5> 30 and <60 mol%; P2O5 2 5 mole% and <20 mol%; Zn0> 0 and <10 mol%; Bi2〇3> 0 and <5 mole %; Fe2〇3 M0 mol% with 25 mol%; Ti02 2 5 mole% and <20 mol%; Te02 2 5 mole% and <20 mole%; and wherein, Ti02 + Fe2〇3 range is 20 mole% to 35 mol%. 16. 如权利要求15所述的玻璃料，其特征在于： ¥2〇5 2 30和<40摩尔％;和P2O5 2 5摩尔％和< 15摩尔％。 16. The glass frit according to claim 15, wherein: ¥ 2〇5 230 and <40 mol%; and P2O5 2 5 mole%, and <15 mol%. 17. 如权利要求15所述的玻璃料，其特征在于： V2O5 2 35摩尔％和< 40摩尔％ ; P2〇5 2 8摩尔％和< 10摩尔％ ;和ZnO 2 3摩尔％和< 7摩尔％。 17. The glass frit according to claim 15, wherein: V2O5 2 35 mol% and <40 mol%; P2〇5 28 mol% and <10 mol%; and 23 mol% ZnO and <7 moles %. 18. 如权利要求15所述的玻璃料，其特征在于，所述玻璃料包括降低CTE的填料。 18. The glass frit according to claim 15, wherein the frit comprises a CTE reducing filler.